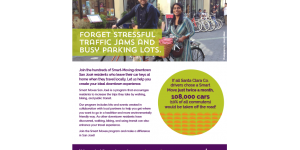 San José is pursuing a variety of strategies to achieve its mode shift goals and reduce its rate of vehicle miles traveled (VMT). By 2040, the city intends to halve the percentage of drive alone commute trips to no more than 40% and increase the percentage of trips made by bike, walking, transit or carpool from 18% to 60%. This will greatly reduce greenhouse gas emissions in the county and relieve traffic congestion. 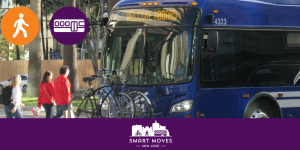 Circlepoint was hired to implement a community-based social marketing program in the city focused on changing travel behavior to meet these targets. This program includes robust research, branding and logo development, creation of marketing materials, and multiple channels for reaching out and engaging audiences in target neighborhoods to effect mode shift. 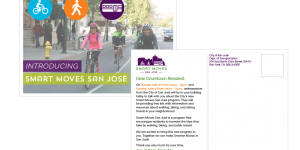 The program aims to reduce vehicle miles traveled to and from downtown San Jose by addressing the barriers residents and downtown employees have to taking transit, carpooling, walking, or biking. Our work includes determining the location, scope, and tactics to be used in each of the three annual campaigns; engaging local businesses and community organizations as partners in the campaigns; compiling, coordinating and tracking the delivery of individualized travel kits and information to all households in the target areas; conducting formative research to refine campaign messaging and strategy; and presenting evaluations of each of the three campaigns with recommendations for improvement in subsequent cycles. Circlepoint has completed the research phase for the first cycle of the program, which targets downtown residents. We then created a program name and logo to tie all outreach materials together into one cohesive campaign, and created materials based on the program implementation plan with this campaign look-and-feel.These materials include kits for helping people walk, bike, and take transit more, with items such as tip sheets, maps, and a calendar of events. 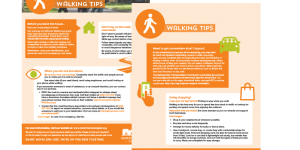 The first phase of implementation included door-to-door outreach, tabling events, and community events that encouraged walking, biking, and taking transit. We are evaluating the success of the first cycle through mailed surveys and observational data to determine which elements of the program were most successful, to help us implement future phases.